A dog's conformation is how it's overall appearance and structure conforms to the Field Spaniel's official standard as maintained by the FSSA and included in the The Complete Dog Book published by the AKC (American Kennel Club). 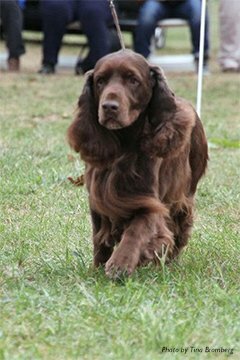 The Field Spaniel standard describes the characteristics that allow the Field Spaniel to perform the function for which it was bred. These standards include specifications for structure, temperament and movement. The evaluation of a dog's conformation is done at select dog shows. Dog shows, where conformation is judged, are intended to evaluate breeding stock or indicate the dog's ability to produce quality puppies. Judges inspect the teeth, muscles, bones and coat texture of each dog with their hands to determine conformation to the Field Spaniel standard. Judges watch each dog in profile for overall balance. Finally, to see how all of those features fit together in action, judges watch each dog in motion (dog gait). The judges then give awards according to how closely each dog compares to the judge's mental image of the 'perfect' dog described in the Field Spaniels official standard. Their are many conformation shows across the nation each year, put on by various All-Breed dog clubs. 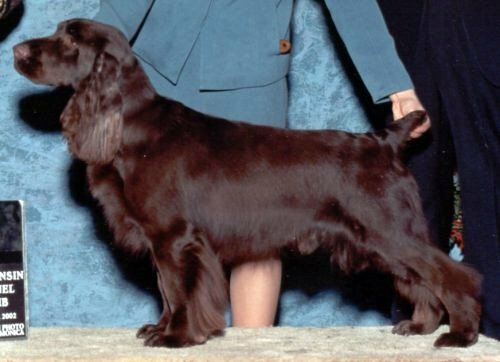 Field Spaniels have shown success at the highest level in these shows, with a handful of them attaining the honor of "Best in Show." 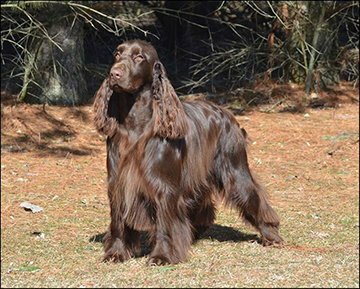 The National Show put on the Field Spaniel Society of America is the Pinnacle of conformation shows for the breed. It is the show case of Field Spaniels and a gathering of the best dogs from across the nation. 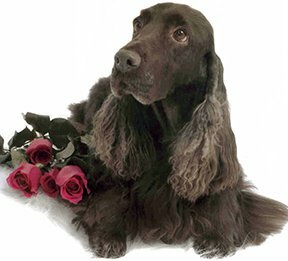 Each year, only one Field Spaniel garners the status of "Best in Speciality Show." It is the top honor for both the breeder and owner of the dog. Congratulations! You have purchased an AKC registered purebred dog, an addition to your family that has brought a new dimension to your life. But aside from being your best friend, he is quite a handsome animal. You've attended dog shows and it looks like something you and your dog would both enjoy. If you'd like to give it a try here's what to do. Join the World of AKC Dog Shows! Any dog registered with the American Kennel Club that is 6 months or older on the day of the show and of a breed for which classes are offered in the premium list is eligible to be entered at a dog show. Spayed or neutered dogs are not eligible to compete in conformation classes at a dog show, nor are dogs with disqualifying faults as per their breed's standard. If you've attended a dog show, you've already taken an important step in getting involved in the sport of showing your dog. If you haven't yet attended a show make an effort to do so. To find out about AKC dog events in your area, you can check the Event Calendar, where you can search by date and by type of event. You can also use the AKC's online Club Search to find out about any dog clubs in your area. Local clubs host dog events and typically offer guidance and resources for interested dog owners. Many offer weekly classes in dog training and handling and can provide information about a variety of dog sports. While visiting the show, inquire at the club table or club tent about breed handling or conformation handling (showing a dog in the show ring). Classes are sponsored by the club. The classes are usually held on weeknights and will teach you the basics of handling your dog. It would also be to your benefit to ask how you may go about joining the club as you are new to the sport and would like to get involved. A list of clubs nationwide is available from the AKC. Dog clubs are involved in many activities besides putting on a dog show and they all welcome new members who want to lend a hand. You'll meet new people and share their knowledge and experiences. The club may also have information about match shows in your area. These are fun shows that are used for practice and training of both dogs and novice exhibitors. While these shows award no points toward an AKC title, they are a great place to "get your feet wet" before entering a real show. If you don't wish to handle your dog yourself, you may contact a professional handler to show your dog. Professional handlers charge a fee for showing dogs, so before hiring a handler make sure you obtain a schedule of the fee. Talk to several handlers, get copies of their rate schedules and visit their facilities. Observe them both in and out of the ring before making up your mind which handler to choose. You will be entrusting them with your dog's care, so make sure you are entirely comfortable before doing so. If there is something you don't understand, make sure the prospective handler answers all of your questions before entering into any agreement. So now you're on your way. You are entering a sport that will bring many hours of enjoyment and education to every member of your family. You will make many friends in the sport, and will enjoy your dog and your new hobby to the fullest extent. Good luck!